Brighten up tired peepers with the Advanced Overnight Hydrating Eye Repair from skinChemists. Featuring a cooling metal rollerball applicator, the intensely hydrating serum is specifically formulated to soothe and nourish the delicate eye area. Utilising advanced skincare technologies, the formula features the unique Beautifeye complex, derived from the Persian Silk Tree, which has been clinically proven to help fade the appearance of dark circles and eliminate puffiness by stimulating blood flow. Gransil DMCM-5 absorbs facial oil and leaves a matte finish, whilst Aquaxyl boosts the natural levels of Hylauronic Acid for long lasting hydration. Skin is left looking plumped and refreshed, with the appearance of fine lines reduced. Press down on the silver rollerball to dispense the product. 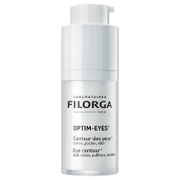 Gently massage into skin around the eyes. Apply onto clean, dry skin. Aqua (Water), Alcohol Denat. (SD Alcohol 40-B), Butylene Glycol, Hydroxpropyl Methylcellulose, Xylitylglucoside, Glycerin, Carbomer, Phenoxyethanol, Pullulan, Anyhydroxylitol, Tapioca Starch, PEG 40 Hydrogenated Castor Oil, Cyclopentasiloxane, Xylitol, Benzyl Alcohol, Polysilicone-11, Dimethicone, Sodium Hydroxide, Porphyridium Cruentum Extract, Ethylhexylglycerin, Disodium EDTA, Parfum (Fragrance), Dehydroacetic Acid, Benzyl Salicylate, Polymethylsilsequiozane, Hexyl Cinnamal, Limonene.